1 x 100% cotton cover, machine washable, natural colour, light and breathable fabric, perfect for the Australian climate. 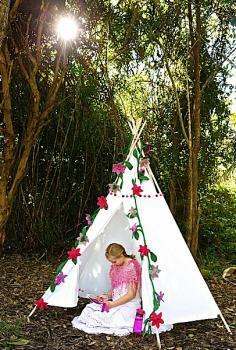 The cover has a tie at the top, to ensure teepee cover stays perfectly in place and can be adjusted. PLEASE NOTE: Your Natural Kids Teepee poles have been split on one end, so that they can be inserted to expand inside their joiner, for strength. Timber has imperfections and while some of the splits may appear to you longer than you think necessary, the split does not compromise the strength of the pole. It is unlikely that they would break, due to this split. A teepee pole would break if it is jumped on or treated roughly. So please enjoy the beauty of the wood, the knots and the imperfections, they make your kids’ teepees / play tents unique, natural and ultra beautiful!